Weir Minerals Europe is a specialist in the provision of mill circuit technology and services, as well as slurry handling equipment for abrasive, high wear applications. The company’s products are found commonly in the oil and gas, and mining sectors. To ensure the company maintains its global reputation, Weir Minerals administers a stringent quality regime and makes regular investments in the best available quality control equipment. At Weir Minerals’ production facility in Todmorden, Lancashire, products are manufactured that can be over 4 m in diameter. Given the demanding accuracy requirements of the company’s Warman slurry pumps product range, for instance, consistently maintaining levels of precision over such large dimensions was proving to be challenging. 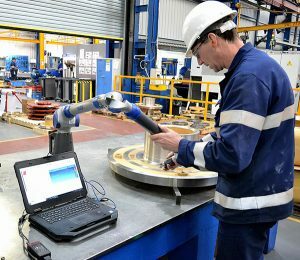 The answer to Weir Minerals Europe’s large-capacity/high-accuracy metrology needs was found in a Faro Titanium measuring arm with a 2.4 m capacity. The use of the measuring arm meant that rather than carry out the slow, laborious removal of a large, heavy component from a machine tool with the company’s overhead crane, then transporting it to a fixed CMM for an in-process measurement routine, that accurate measurements could be made while the part was still located on the machine. Not only did this new method reduce inspection times while delivering the required levels of precision, but the difficulties associated with disturbing large component set-ups, then returning them to the machine tool for further operations, were brought to an end. The success of Weir Minerals’ original Faro measuring arm meant that, as the company introduced even larger products, a second 3.6 m capacity Faro Quantum arm was soon purchased. To complement the tactile probing products, and to provide additional inspection capabilities, Weir Minerals has also invested in non-contact Faro scanning devices. As recent increased levels of production had the potential to place a strain on the company’s existing inspection provision, two Faro Arms were purchased. Andrew Horsfall, quality supervisor at Weir Minerals Europe, explains: “Weir Minerals products are used in demanding, abrasive areas such as slurry transportation and mineral processing plants. Our expertise lies is in the delivery of wear-resistant engineered products, which have a reputation for delivering outstanding reliability and longevity. To uphold our hard-won reputation for the quality and long-lasting nature of our products, we oversee a strict quality system. In addition to in-process quality checks being made at each stage of manufacture, each product also undergoes a comprehensive final inspection routine. 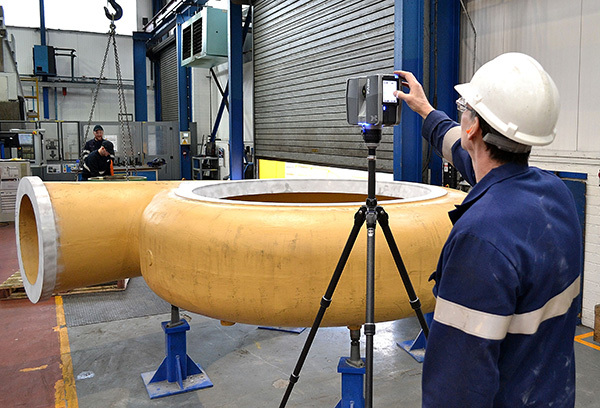 “Before our use of Faro products, although our large fixed CMM had the capacity and accuracy specification to undertake the inspection of all of our products, we were aware of the time being spent in removing large, heavy products from machine tools in mid-cycle to allow the necessary in-process dimensional checks. Having searched for a suitably precise, portable means of inspecting large products while still on the machines, we witnessed several system demonstrations. As we were extremely impressed with the precision, speed and portability provided by the Faro Titanium measuring arm, we were happy to place an order. “Following a brief training course, the simplicity of our new measuring arm’s controls and the logical nature of Faro’s software meant that I soon became proficient in the system’s use,” he continues. “I was then able to train my colleagues in the measuring arm’s operation. “The use of our first Faro arm was a real game changer; it meant that the need to remove large components from machine tools for in-process inspection, then to replace them for further machining, was completely eliminated. Our new inspection method also removed the problem of interrupting a component’s set-up in the machine tool, then attempting to return it to the same position. 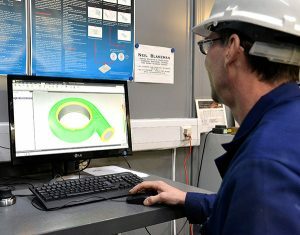 As well as enabling us to consistently achieve our demanding dimensional tolerances, the use of our original Faro arm allowed us to significantly reduce production cycle times across our range of larger products. FARO’s range of 3D measurement hardware and software products provides users with turnkey solutions for manual and automated inspection and actionable analysis of any component or final assembly. The company’s range of portable CMM solutions include measuring arms, trackers and imagers, each said to represent robust, accurate solutions for precise measurement or inspection in industrial or manufacturing environments.